52 Ancestors, No. 12: Sorrelona Angeline Butera, Big Sister | Photo Restorations by Tim G.
I don’t know a whole lot about my ancestor No. 12, but her image here is a great reminder of why I got into this business. 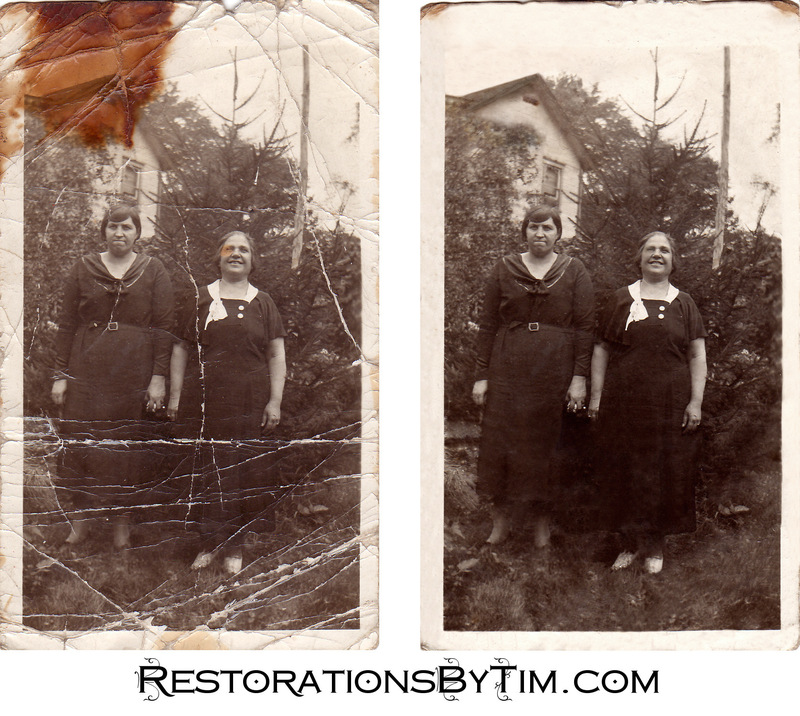 It is the quintessential photo restoration project. I have exactly one picture of this woman, and guess what: It’s wrecked. Wrecked, but salvageable. A little digtial wizardry and voila! Virtually good as new! Well, enough about me. Let’s get to our subject. Meet Angeline Scaletta, or Aunt Angel, as my grandmother called her (pronounced AHN-jel). She is standing at right in the above photo, next to my great-grandmother, Katherine (Balmer) Scaletti. She was the older sister to my great-grandfather, Antonino Rocco Scaletti. According to civil birth records, she was born in Trabia, Sicily, on April 15, 1884. That made her a full nine years older than Nino, who was born in 1893. Nino also had two older brothers: Giuseppe, aka Joseph, who was born in 1881, and Carmelo, aka Uncle Charly, who was born in 1890. I’m not sure whether she married her husband, Antonio Butera, in Sicily or in America. I haven’t found records in either place. Census records indicate that she was married in 1911, the same year emigrated. I’m leaning toward Sicily, because if they were married in Pennsylvania then I should have found a record of it on FamilySearch.org. I haven’t found Aunt Angel’s ship’s passenger list, either, so there is plenty of research to go around. I know a that several of the Butera children have marriage records on FamilySearch.org. High time I download and filed them. Census records show these children of Antonio and Angeline Butera, born between 1911 and 1926: Lina, Mary, Annie, Anthony, Joseph, Samuel, Rose, and Charles. These census records also show the Buteras to be a farming family, living on Cliff Mine Road, Moon Township, Pennsylvania, just west of Pittsburgh. I hear the locals called this place “Scallyville” on account of the prevalence of Scalettis who lived there, my great-grandparents among them. Antonio Butera died in 1957. Angeline followed sixteen years later, in 1973. A photograph of their final resting place, Holy Souls Cemetery, Pittsburgh, is available at Find-A-Grave. My uncle remembers that my grandfather, Morris Anflick supported the Pennsylvania gubernatorial campaign of Republican House Minority Leader Bob Butera in 1978. My uncle remembers that there might have been a family link there, but I have not yet established that. I’ll surely look into it. So here is to big sis, Aunt Angel, Angeline Scaletta Butera. We remember you! Many thanks to Uncle Bob for the photo, my grandmother, Betty and my Uncle Craig for sharing their memories.